The surprises begin within feet of his front door. ‘That’s amazing! That doesn’t exist!’ he enthuses, pointing out a poster thrown from the back of a lorry on the night of the October Revolution in 1917. Hanging next to it on the crowded wall is the poster ‘Death to World Imperialism’ (1919) by the revolutionary artist David Moor. It has taken King 25 years to track it down. Posters, prints and paintings climb the stairwell. As you head upwards to King’s studio at the top of the house, everything creaks: the floorboards, the staircase, the banisters. There is so much to examine that progress is slow. King made much of the furniture and many of the wooden fittings in an angular constructivist style resembling his designs for books and agitprop posters. From his writing room, where he taps out no-nonsense prose on an old Remington portable, you can see a giant fake stone head of Karl Marx lying in the garden – a prop from the 1960s movie Morgan: A Suitable Case for Treatment. And here in the living room full of wirelesses designed by Wells Coates is a Trotsky mug from 1923 that once belonged to a man King describes as ‘the last British Stalinist’. Only 700 such mugs were made. ‘It just doesn’t exist,’ he exclaims, with a burst of manic laughter. A conversation with King about his treasures is always punctuated by his wild chuckles. In recent years, there has been plenty of speculation about the possibilities of graphic design as a medium of authorship. None of it would hold much interest for King. He is the genuine article – a designer-author – and has been since 1972, when Penguin published his Trotsky: A Documentary. The book was a collaboration with Francis Wyndham, a colleague from the Sunday Times Magazine, Britain’s first colour supplement, where King was art editor from 1965 to 1975. Since his days as a student at the London College of Printing, he has been driven by an overriding need to lock horns with content that means something to him. Sunday Times Magazine, 19 April 1970. 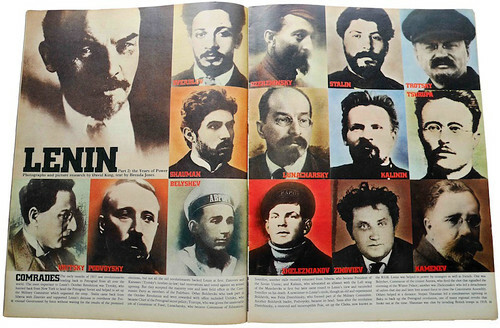 Cover by King and the second part of an article about Lenin with picture research and layout by King. Top: David King by Don McCullin, published in Blueprint, 1984. His decision to start the collection that has become his life was prompted, in 1970, by a research visit to Moscow’s photographic archives. When he asked to see pictures of Trotsky, he was told: ‘Trotsky not important in Revolution. Stalin important!’ All traces of the revolutionary leader had been removed. 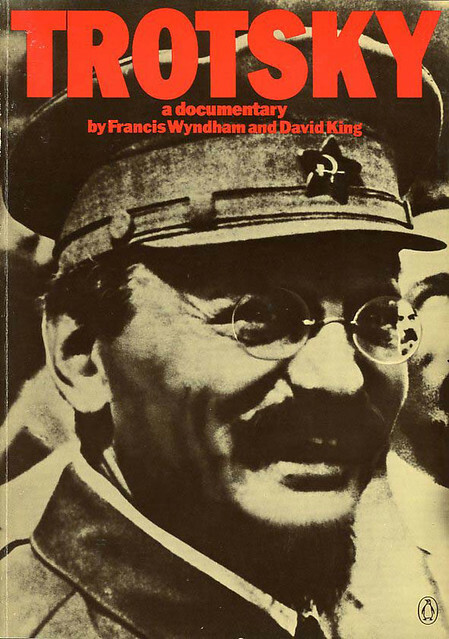 Trotsky: A Documentary, Penguin, 1972. Cover and book design by King. The first volume to make use of King’s fast-growing private collection. The terrifying process by which thousands were first murdered by Stalin’s butchers and then, if they were public figures, eradicated a second time from the historical record by his retouchers and scissormen has become King’s great theme. In his book The Commissar Vanishes (1997), he delves into his archive of more than 250,000 images to document, as never before, the falsification of photographs and art in Stalin’s Russia. 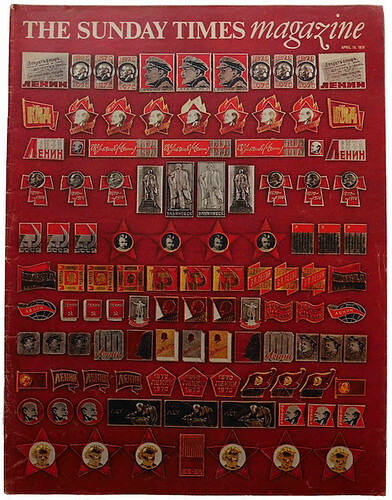 ‘I spent an awful long time going through the collection,’ he says, ‘and it was very exciting because I found more and more, and I couldn’t believe it – things I’d stared at for years.’ Much of the five years he spent working on Commissar was devoted to finding out the names, occupations and precise fate of those we see expunged person by person from group portraits and documents of official occasions, until only the dictator and perhaps a handful of lucky ones remain. Once these ‘enemies’ of the regime had been arrested or had disappeared forever into the Lubyanka, headquarters of the secret police, it was each citizen’s responsibility to ensure that any pictures of them in privately owned books were defaced or destroyed. One of King’s most extraordinary discoveries came in 1984 when he visited the Moscow studio of Alexander Rodchenko, one of the great figures of Russian art, design and photography. When he opened Rodchenko’s copy of Ten Years of Uzbekistan, designed by the artist in 1934 to celebrate a decade of Soviet rule in the state, he found that Rodchenko himself – on pain of arrest – had obliterated the faces and names of purged Party functionaries with surrealistic veils and blocks of ink. It was ‘like opening the door onto the scene of a terrible crime’, King writes. 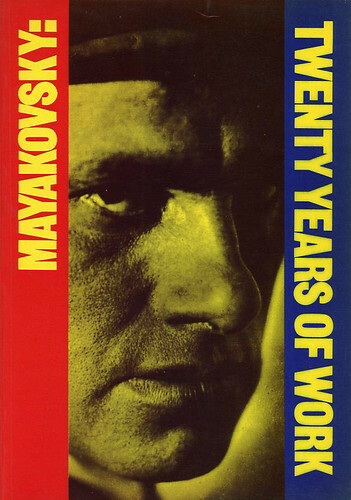 Mayakovsky: Twenty Years of Work, Museum of Modern Art, Oxford, 1982. Cover and catalogue design by King. 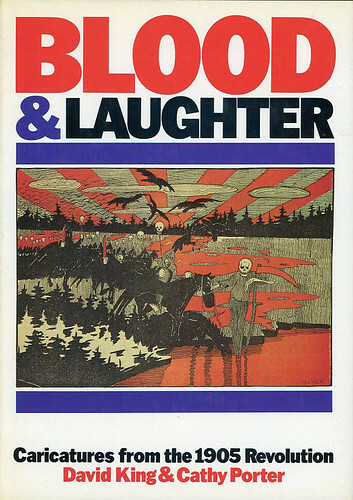 Blood & Laughter: Caricatures from the 1905 Revolution, Jonathan Cape, 1983. Cover and book design by King. 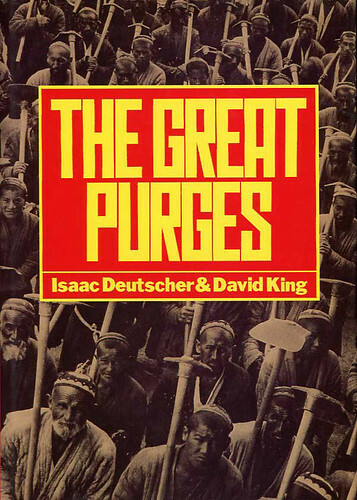 The Great Purges, Basil Blackwell, 1984. Cover and book design by King. 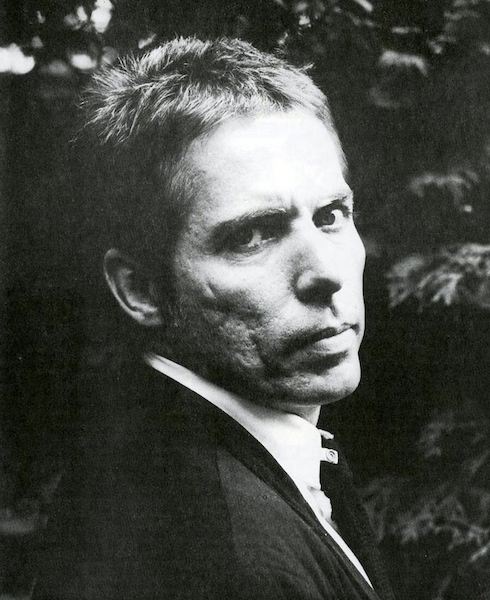 For ten years, after this burst of production, King grew quiet, partly because of changes in the political climate – ‘Mainstream publishers didn’t want to publish photographic books of leftist subjects; not from a leftist viewpoint, anyway’ – and partly because of his reluctance to learn how to design by computer. The main reason, however, was the ascendance of Mikhail Gorbachev and his policy of glasnost. Suddenly the photo collection, which had always been a ‘back-burner thing’ viewed by some of King’s acquaintances as a waste of time and money, was in demand. He began taking media calls from all over the world, requesting pictures of Lenin, Trotsky and Stalin. Maintaining the collection and handling enquiries became close to a full-time job. The pictures – slides, transparencies, prints – are filed in sixteen red cabinets in the studio at the top of the house. (King loves red: even his bright red Jeep Cherokee looks like a constructivist slab on wheels.) There are drawers full of people – Kalinin, Kamenev, Kerensky, Kirov – some of them still awaiting the day a researcher will call. Petrovsky? ‘Nobody ever asks for him,’ says King. And there are drawers organised by theme: ‘industrialisation’, ‘famine 1932-3’, ‘literacy and education’, ‘women’, ‘health and children’, ‘show trials’. King’s quest has no end: there are a dozen or so items he has been trying to find for years. He spent a decade looking for a book that turned out not to exist. Sometimes he is lucky and the material finds him. One day, pre-glasnost, the postman brought a huge box containing 1500 photographs sent anonymously from Russia. The last time we met, King was just back from Moscow, gushing about a 1928 album on the history of the Bolsheviks, which he had discovered in an antiquarian bookshop, with no fewer than 39 images scribbled on or scratched out. The Commissar Vanishes: The Falsification of Photographs and Art in Stalin’s Russia, 1997, new edition, Tate Publishing, 2014. Cover and book design by King. It was an unfair question, though, because his answer is already there in his books. He would like to use the collection to create a visual history of Russia. ‘There’s so much stuff that’s never been published and it would be a real eye-opener … the true history of what happened.’ Few can be better qualified for the task than King. 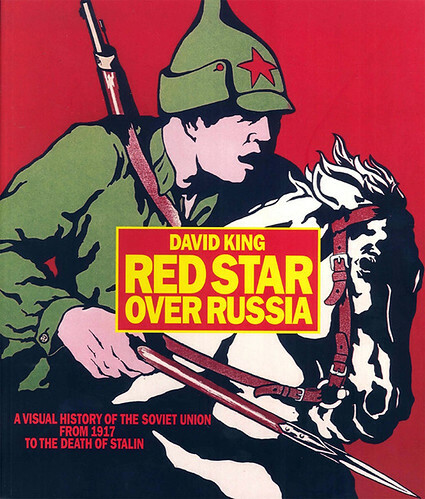 Red Star Over Russia, Tate Publishing, 2009. Cover and book design by King. The last time I spoke to King, on the phone earlier this year, he was in the process of transferring his extraordinary collection to Tate Modern, which had bought it. This was the culmination of a highly productive relationship that developed after the Bankside building opened in 2000. Items from King’s collection were regularly on show at the gallery, in their own dedicated room, and Tate Publishing became King’s publisher. 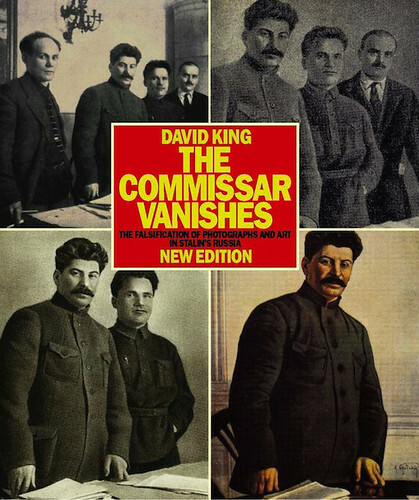 Tate issued a new edition of The Commissar Vanishes (2014) and also published Russian Revolutionary Posters (2012), John Heartfield: Laughter is a Devastating Weapon (2015), which was to be his last book, and Red Star Over Russia (2009), an illustrated history of the Soviet Union from 1917 to the death of Stalin. King mentions his plans for this gargantuan project at the end of my article. Using posters, photographs and graphics from his collection, he constructed a masterpiece of visual history.